Rise Like Lions is another well written adventure from the pen of David Mack. It’s not the tour de force that his Star Trek: Destiny trilogy turned out to be nor does it have any very interesting characters as in his Star Trek: Vanguard series, but it was an enjoyable way for this Trekkie to kill a weekend. The story takes place in the Mirror universe (first visited in the TOS episode “Mirror, Mirror”) and covers the final days of the Terran Rebellion, the collapse of the Klingon/Cardassian Alliance and the realization of Emperor Spock’s dream of a new society based on principles familiar to any Federation citizen. Like The Sorrows of Empire, this book suffers from too many POVs and an episodic narrative that neglects character for action. I like Mack too much as a writer, however, to have cared about it until after I had closed the book. And now that I have closed the cover, several things gnaw at me. One is that there were too many deus ex machine moments. There were times I felt I was reading an ERB novel the lucky coincidences were coming so fast and furiously. An especially egregious example is the use of Kes (from “Star Trek: Voyager”). She has a chip implanted in her brain by Memory Omega (see below) that blocks her god-like psychic powers because she’s a loose cannon and can’t be trusted to use them wisely. Circumstances put her on a rebel starship – a prisoner – when a Cardassian fleet is about to wipe out the rebellion’s leadership. Tuvok (also from “Voyager”) deactivates her chip, and Kes destroys the Cardassians but she then disables him and declares herself the new Empress. But wait! There’s a failsafe device in the chip that turns her brain into scrambled eggs, and within two paragraphs, the threat is removed. Very convenient; very annoying. Now I must return to my problems with overly convenient plot devices and mention Memory Omega – the clandestine organization of scientists that Emperor Spock set up to eventually lead the Empire (& galactic civilization) toward a more just and humane (in an all-encompassing ET+human sense) civilization. It reminds me of nothing so much as Asimov’s Second Foundation and it’s just as problematic an organization as Asimov’s. Omega’s agents are conveniently (there’s that word again) placed throughout known space to assassinate the right leader or influence the next council meeting to move events in their favor. And when the rebellion loses most of its fleet and is in danger of foundering on the reefs of its leaders’ egos, Omega is there to provide an inspiring, neutral leader (Jean-Luc Picard); a fleet of ships (Sovereign class heavy cruisers); and super-advanced technology to save it. I’m also disturbed by the new polity’s willingness to use weapons of mass destruction like the Genesis device. Soon after the rebellion establishes the Galactic Commonwealth, Memory Omega issues a threat to all the surviving powers that, if they interfere with the Commonwealth or try to block any planet from joining it, their worlds may be visited by Genesis torpedoes that will destroy all life “in favor of its new matrix.” It’s either lazy writing or – I hope – laying grounds for later stories that explore how much further the Mirror universe has to go before truly realizing Spock’s dream. “This rebellion hasn’t just been about slavery or freedom. It hasn’t been about revenge. We fight for a belief. For the idea that we can all live together as equals under the law, no matter who we are or where we came from. Our goal hasn’t been to bring back the Terran Empire, or even the Terran Republic, but to build something new, something better. It’s been about making ourselves better, so that we can deserve to live in this new world we’re fighting to create. “What’s been suggested here tonight – wiping out most of Cardassia to make a point and break their will – is the sort of thing our ancestors would’ve done. It’s what the Terran Empire would’ve done. And that’s exactly why we shouldn’t do it. Embracing this kind of merciless, scorched-earth warfare would be a major step backward…. This is the kind of philosophical question that the best Trek can bring out. Consider O’Brien’s last paragraph in light of United States history and the country’s continued refusal to come to terms with slavery or genocide, for example, not just its implications for future Trek novels. For its faults, I can only give Rise Like Lions a relatively tepid three stars but I’d still recommend it. 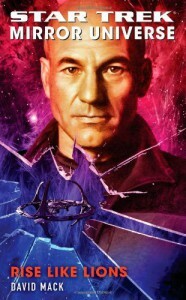 * A more representative book cover would have had a picture of O’Brien & Calhoun (& maybe Saavik) rather than Picard, who’s practically a cipher in the novel.